Eye drops can now dissolve cataracts. What your eye doctor doesn't want you to know. The story of a crime. The information available here will not be provided by an eye doctor. They are more interested in your money than saving your vision. The problem. As we age, we are more likely to develop senile cataracts, and the number of persons in the United States affected by cataracts is estimated to rise to 30.1 million people in the next 20 years, an increase of 50 percent. Cataract is the leading cause of blindness in the world today and is also the leading cause of vision loss in the United States, responsible for about 60 percent of all Medicare costs related to vision. Senile cataract is caused by the nuclear matter of the elderly human lens hardening and taking on a yellowish/brown color. The lens of the eye, which is mostly water and protein, becomes clouded or opaque, resulting in poor vision or vision loss. The light passing through the lens is scattered, making it impossible to attain normal vision even with corrective lenses. Cataract is more common in older people. The prevalence of age-related cataract is expected to increase as the U.S. population continues to age. This is a tremendous financial burden on society. In the US alone, $3.5 billion is spent every year on cataract operations. This hardening and discoloration of the lens is the result of lifelong cross-linking (or glycosylation) of the lens proteins with ascorbate. This persists in the aqueous humor at high concentrations, due to the kynurenine derivatives, and takes place due to the low availability of natural defenses in the form of anti-oxidants, (which decline with advancing age). Studies have shown that a vegan diet can greatly reduce the risk of getting cataracts. The usual treatment. Surgery is the only treatment offered by eye doctors. It involves making an incision into the cornea and removing the contents of the lens capsule. An artificial lens is then inserted. While most of these operations are successful, complications do occur, ranging from minor eye inflammation to devastating vision loss. Some common complications are infection, a dislocated intraocular lens, retinal detachment, or a posterior capsule opacity. A PCO is a hazy membrane (capsule) just behind the artificial intraocular lens (IOL) that was implanted during the surgery to replace the eye's natural lens. Severe vision loss may occur as a result of infection or bleeding inside the eye. Eliminating cataracts without surgery. Ordering information. Mark A. Babizhayev, Ph.D., a scientist based at the Moscow Helmholtz Research Institute for Eye Diseases in Russia, developed and patented eye drops in 1998 which contain the natural di-peptide N-acetylcarnosine (NAC) as its active ingredient. 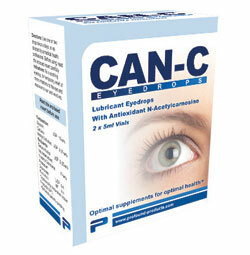 The patents are held by his research group Innovative Vision Products (http://innovative-vision-products.com) which markets the eye drops under the trade name Can-C at www.can-c.net. Click on the "Buy it Now" link under the picture to order. That will take you to the order form. The product is mailed from Europe and there is a shipping charge. More information on this product can be found at nacetylcarnosine.com. In the US, you would do better to buy it from www.heranswer.com at about the same price and without a shipping charge. Click on Eye Health. They also offer quantity discounts and quick delivery. One drop is put into the eye twice daily. Within 15 to 30 minutes, the NAC passes through the cornea and the cataract begins to dissolve from the outside of the lens toward the center. There is some evidence that NAC is also beneficial in cases of glaucoma, presbyopia and other disorders. An excellent book on this subject, The Cataract Cure, can be purchased from iuniverse.com. The following is taken from the "Expert Opinion" link on Can-C.net. Essentially, N-acetylcarnosine is a "carrier" for the di-peptide L-carnosine into the aqueous humor of the eye (this is the fluid area surrounding the lens). It is here that the substance becomes most active in its ability to basically act as a natural and comprehensive anti-oxidant. Once N-acetylcarnosine has delivered L-carnosine safely through the aqueous humor into the lens, the L-carnosine itself is flushed out of the eye via the canal of schlemm, and once into the bloodstream it is broken down by carnosinase and excreted. N-acetylcarnosine is acting as a time release version of carnosine resistant to hydrolysis with carnosinases. The major role of N-acetylcarnosine and L-carnosine is their facility to act in the biological system as universal antioxidants. They possess the ability to protect cells from oxidative stress, both in the lipid phase of cellular membranes and in the aqueous environment. L-carnosine is able to reduce the content of lipid peroxidation products in the peroxidized lens fiber cells plasma membranes, and to repair their structure accordingly. It is the only known anti-oxidant able to protect structural proteins of the lens/alpha-crystalline, from the free-radical induced oxidation process. 88.9% had an improvement of glare sensitivity. 41.5% had an improvement of the transmissivity of the lens. 90% had an improvement in visual acuity. The pictures below show the treatment of human cataract with the eye drops of 1% Can-C for the period of 5 months. The left image shows the appearance of cataract which resembles a bat in its form and the right image shows that this opacity has disappeared after the cited period, after treatment with n-acetylcarnosine is completed. The lens has become clearer. The action has been described as a snow melting effect. Clinical trials carried out in China on 96 patients with cataracts of varying degrees of severity showed a profound effect; with positive effects being 100% on primary senile cataract and 80% for mature senile cataract over the 6 month trial period. Positive effects were also observed with other types of cataract. Another trial indicated an eye condition improvement of 41.5% to 100% for patients within a 6-month period, with sustainable results 24-months later. Why go all the way to China to do a study? Why not do one in the US or other countries? Could it be that the government of China is less dominated by commercial interests than elsewhere? Why is the public not told about this marvelous development? Some ophthalmologists do as many as 30 cataract operations per day. The average cost is over $3000 per eye. Do the arithmetic and you will see why they will never have any interest in eye drops. If NAC becomes widely used, they will lose this income. Also, optometrists would lose any kickback fees they may be getting for referring patients to the surgeons. There is a tendency on the part of both ophthalmologists and optometrists to recommend surgery before it is actually needed. The sooner surgery is performed, the sooner they get their money. But, sadly, the roughly 2% of cataract operations that develop serious complications will occur that much sooner in the patient's life. That is what is so disgusting about the profit-making side of this business. To learn just how widespread this practice is, you only need to do an Internet search for "cataract surgery kickbacks". This situation is similar to the referral of customers who have been talked into Lasik surgery, usually to correct myopia which could have been prevented. A kickback from the surgeon to the optometrist of $1000 is not uncommon. Kickbacks are actually illegal, but by calling them "co-management fees" or something else, they can get away with it. But the customer isn't informed that this is the real reason that surgery is being encouraged. This discovery that cataracts can be removed with eyedrops is comparable in importance to the discovery of vaccines for polio and smallpox, with one big difference. Those vaccines are very profitable for the drug companies that make the vaccines and the doctors who administer them. NAC eye drops, on the other hand, do not bring profits to drug companies or doctors. Therefore, this development is ignored. Because N-Acetyl Carnosine lacks FDA approval as a cataract cure, the companies selling it are wary of making claims for it. The boxes containing the eye drops only claim that the drops help "soothe tired eyes" -- and they list NAC as an "inactive ingredient." Of course, The FDA has been totally corrupted by big business for a long time and is against anything that would reduce the profits of the eye care business. She said that there are four stages of cataract development and that I had arrived at stage four. Consequently I needed a cataract operation. She even gave me the name of a cataract surgeon she recommended. Now, there are millions of people in developing countries that are blind or nearly blind from cataracts. So how could I be in the last stage of cataract development? It is possible to get a driver's license in virtually every state in the US with 20/40 vision. Some states even have looser standards. Obviously something isn't quite right here. Could this be a rating system devised by cataract surgeons to get people to come in for surgery by saying, "Your cataract has progressed to the final stage. Time to operate." If so, why would optometrists use this same fraudulent system? Because they get kickbacks from the surgeons? What other reason could there be? You will get the same treatment from every vision specialist in the world, with few exceptions. How can they urge people to have surgery before it is needed when they know that some of these people will lose their vision permanently from complications of the operation? I asked the optometrist to send me a letter, summarizing the results of my visual exam, in order to have an official record of my problem and what I was told. She was kind enough to do so. You can read that letter here. As my prescription indicates, a considerable amount of my problem is astigmatism. No one seems to know why astigmatism should increase with age like this, although it could be caused by the developing cataracts. But the astigmatism can be easily corrected. After I purchased the new glasses inexpensively online, I checked my vision at home with an eye chart and confirmed that I could not see better than the 20/40 line with either eye. While doing an Internet search to learn more about cataracts, I came across some information about eye drops that could dissolve the defective protein in the lens that causes the light to scatter. I started using the NAC drops on February 22, 2010. I put one drop in my right eye twice a per day. I did this for two reasons. First, if there was any negative reaction from the drops, I wanted it to affect only one eye. Second, I felt that comparing the treated right eye to the untreated left eye would be a good scientific test of the effectiveness of the drops. I pulled the lower eyelid forward, put in the drop, closed the eye, and moved the eye around a little to distribute the solution over the surface of the cornea. Then I kept that eye closed for one minute, as is recommended. This helps prevent the solution from being rapidly washed away into the tear duct by blinking. An option is just to press on the tear duct for a minute or two after applying the drops. On April 10, 2010, less than two months after starting the treatment, my right eye could read the 20/30 line on the eye chart. The left eye was still reading only 20/40. This was very encouraging and I felt confident that another two months of treatment would have me reading 20/20 with the right eye. I then planned to start treatment on the left eye. Update, August 26, 2010: My eyes were examined by a different optometrist. He claims that the cataracts are still present and that each eye can see only 20/40 with corrective glasses, but both eyes together see 20/30. He also claims that I am in stage 3-4, rather than the previous stage 4. Perhaps that indicates some improvement. I felt that the eye chart in his office was rather dim. When I test my vision at home with more light on the test chart, the right eye sees all of the 20/30 line and part of the 20/20. The left eye sees 20/40 and part of the 20/30 line. For the time being I have stopped treatment, to give the eyes a "rest." I feel there has been some improvement, but the cataracts have certainly not yet "dissolved." Nevertheless, if the drops can merely prevent cataracts from getting worse, that is success in itself. My prescription is essentially the same as before. Update, July 25, 2011: I have been using drops twice daily in my left eye for over six months. I have been using drops in my right eye for the first five days of each month, to try to retain any improvement that I may have had earlier. Using an eye chart at home, both eyes can now separately read the 20/30 line. Using both eyes together, I was just able to read the 20/20 line. I am convinced my vision has improved with the use of the drops. It certainly has not gotten worse. Even that would have been success. To download an eye chart for your own use, go to www.myopia.org/savechild.htm and click on the link. Update, October 12, 2011: Checked each eye separately and each is reading 20/20 with corrective glasses on. I could even make out a couple of letters on the 20/15 line using both eyes together. I am now only using the drops for no more than one week each month to retain the improvement. Update, February 14, 2012: A vision test by a new optometrist showed no change in my prescription was needed. But my vision was 20/25 with each eye separately and 20/20 with both eyes used together, similar to the results that I get with my home eye chart. She also said that there was no need for a cataract operation. The cataracts are still present, but it is not possible to measure objectively if they are different than at previous exams. But since the acuity has improved, this seems to indicate than the cataracts have improved. I intend to continue using the drops on a regular basis, twice per day. And I now feel comfortable in recommending these drops to others. Summing up. I have no financial interest in promoting these eye drops. My sole interest is to try to end the mistreatment of millions of people by those who value money more than our health. All of my websites have this common goal of informing the public about how we are being exploited by the sickness care industry. The first media attention that was devoted to this amazing discovery was a full-page article on December 16, 2003 in the U.K. newspaper Daily Mail. And it gained additional popularity after being featured on a U.K. television program called The Richard & Judy TV Trials show. The show conducted its own short experimental trial to see if the eye drops could live up to their claim of improving vision. The four people who tried it (including the hostess, Judy) did say they noticed their vision had improved. After seeing the show, hundreds of other people tried the formula. This should have set off a frenzy in the eye care world to verify these astounding results and offer the drops to the public. Instead, predictably, it set off a frenzy of activity to insure that nothing more was said about it. To my knowledge, no one in the US media has even mentioned this discovery which rates as one of the most important medical discoveries of all time. It deserves a Nobel prize. About 28,000 new cases of cataract are reported worldwide every day. About 17 million people around the world are blind due to cataract. In developing countries, neither the money nor the manpower is available to provide surgery. The world's vision specialists should be eagerly sharing this new treatment with us, but their only interest is money. The millions who go blind do not interest them. 1. Cataracts: They encourage people to have risky cataract surgery, leading to blindness for some, when a safe and cheap way of dealing with the problem exists. 2. Myopia: They put glasses on young myopic children that make the vision get worse, leading to blindness for many, when a simple pair of reading glasses can prevent this. Details at myopia.org. 3. Macular Degeneration: While this can be a result of high myopia which was not prevented, in most cases it is the result of a faulty diet leading to poor circulation to the eyes. The proper treatment is a vegan diet. You will not learn any of this from a vision specialist. Details at cholesterolcheck.org. 4. Corneal surgery: By failing to prevent myopia, they cause many people to undergo risky, sight-threatening Lasik surgery. Any questions? Send us an Email. Does anyone in your family suffer from nearsightedness? Do you know that wearing glasses will make the vision worse? Do you know anything about Pinhole Glasses? Do you know how important your diet and cholesterol level are to your health?